Foster Peak is the west shoulder of Numa Pass, north of Floe Lake in Kootenay National Park, and forms part of the Rockwall. Name Notes: Named in 1932 after Sir George Eulas Foster who was a Canadian diplomat. 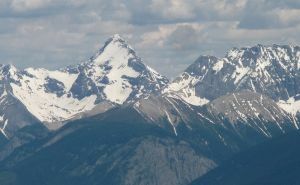 Another source lists the peak as being named after W.W. Foster, who climbed Robson in 1913.